We are going Taiwan in October! I'm excited to be going on a holiday. Our last vacation was more than a year ago - Switzerland last May. And I really like the food in Taiwan so I'm glad we are going there. I'm worried at the same time though, because we'd be going there with Little N.
She'd be slightly over 1 year old by then..
What if she doesn't take well to the flight? What if she can't sleep in a hotel? And if the travel tires her out too much and cause her to be cranky all day..
Oh dear. Our trip is 10 days - will I end up wanted to fly back on Day 3? So I have been asking around for travel tips from friends and reading up on some tips from mums online. Feed during take-off and landing - Babies don't know how to pop their ears, so it's helpful to feed them - milk or water when the plane takes off + just as the plane begins to descend, to help ease the ear pressure. Sit apart on the plane with your spouse - so if you switch the baby between the 2 of you, you each get some time off in between and are not on co-baby duty throughout the whole flight. Ask for a baby cot at the hotel - so that you don't share the bed with your baby during the vacation and then end up having to do that when you return. Particularly if you don't sleep on the same bed at home. If you can't get a baby cot, invest in a travel cot. Consider renting an apartment - it'd give you more space and you can have a meal in the dining room or watch TV in the living room whilst the baby is sleeping. Do you have other tips for travelling with a baby/ young toddler to share? 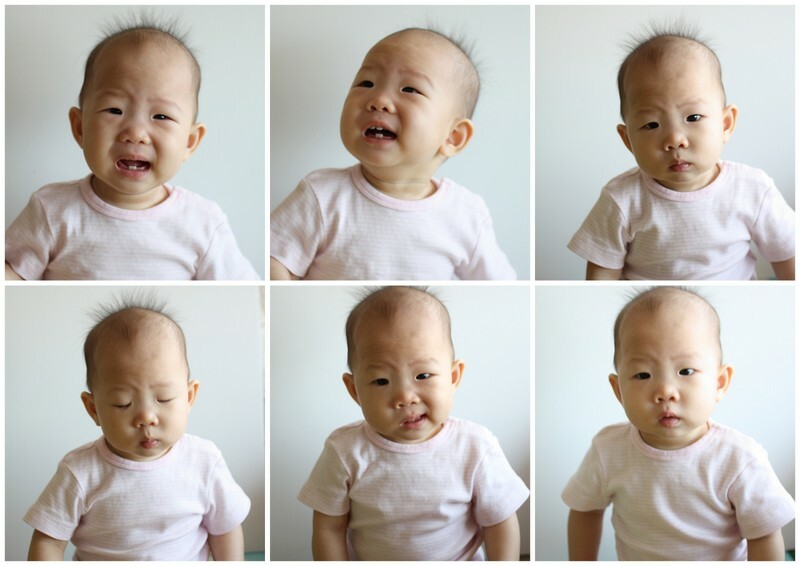 Passport photo shots of Little N - I love the photo on the bottom left! Hahah..
Bring along your baby carrier (instead of stroller). I find that for young babies, baby carrier is the best way to travel instead of a bulky stroller. The only downside is that baby sometimes fuss due to the heat. But if Taiwan is nice and cool, a baby carrier is a must! The one you listed is what I practice too! and of course the baby carrier is the best! Have a nice trip! I wish I knew all this when my kids were tiny! You Mommies are so wise!